A nurturing doll from Madame Alexander's Babble Baby Collection.Babble Baby is ready to be your baby's baby! 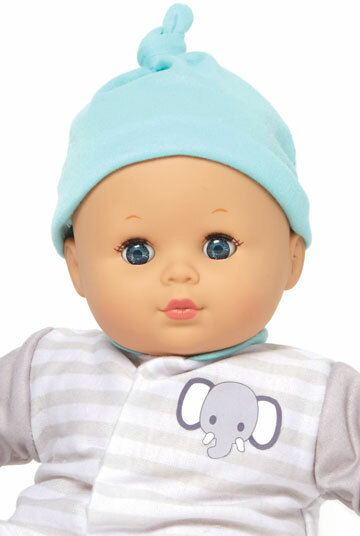 Measuring 14 inches, he is the perfect little baby doll. Soft vinyl limbs and a soft huggable cloth body are perfect for tiny hands to hug with extra love. Babble Baby will engage your child with gentle sounds for the ultimate playtime. He wears a blue, gray and white cotton onsie with a matching hat. 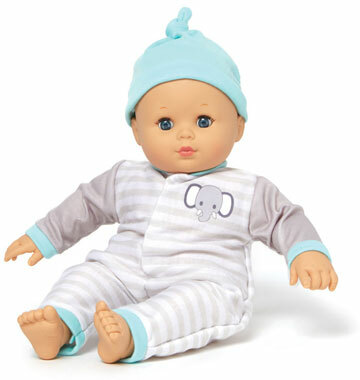 This is the perfect baby doll for any small child over 18 months old. Arrives packaged in a Madame Alexander window box. Stripe Babble Baby 75230 is part of Madame Alexander's Babble Baby Collection.